Fly Casino Jackpots are Soaring! Right now Jackpots at Fly Casino are over a combined $10,000,000! Yes you are reading that right there is over 10 Million Dollars to be won in our Jackpot specific games. 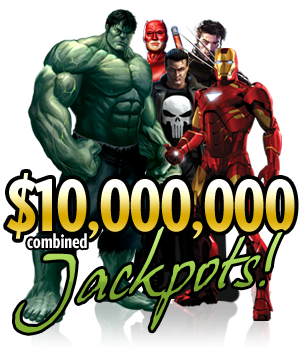 The Marvel Slots Jackpot is almost at $750,000 to go along with huge Jackpots at WallStreet and Beach Life. These Jackpots are ready to blow so get in there and take a shot at them! Over the next couple weeks we will be releasing two new exciting games and a couple exciting ways to provide our members with more value. We are constantly trying to perfect your gaming experience and we believe these next couple additions will be very enjoyable to our members. Over the next couple weeks make sure you keep an eye out for our newsletter, as all details will be revealed soon. Also on Monday August 19th, 2013 from 00:00 GMT until 23:59 GMT all Fly members will earn 10X comp points on all games! 5X’s more comp points on every game to go along with the $/£/€10 for $/£/€20.00 bonus. Now that’s value!